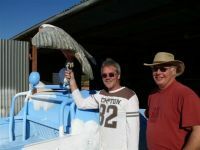 This is the quirky brainchild of Graham Pickles who was inspired by a similar thing done with Cadillac's in Arizona.My involvement in the Utes project came about after receiving an email from Graham, the man responsible for Utes in the Paddock. 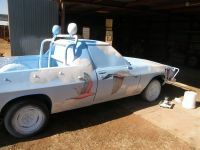 I was asked to paint a Ute in a paddock in the middle of nowhere for the fun of it! I would be the first artist, followed by another dozen or so Australian artists. After half a minute consideration I agreed! 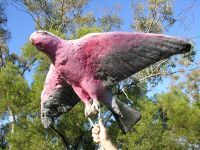 My ute is called Circle Work, pertaining to the practice of madly driving a ute flat out in circles, better performed if "bundied up"
I have used the galah as a reference to the larrikin lads and "ladettes" driving such utes. 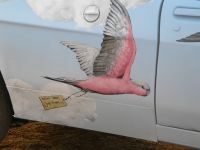 I painted the ute sky blue and have the galahs flying in a circular motion around the ute. 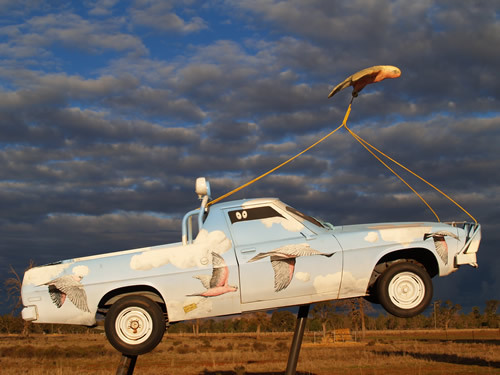 The galah towing the ute away represents the fun police. All of the artists involved in painting Utes are exhibiting together for the first time this in October. UTES AT THE CARRINGTON opens to the public on Sunday October 4th at the Carrington Hotel, Katoomba. The exhibiton runs until Saturday 29th November, so there will be plenty of time to catch it. I am excited to have the opportunity to exhibit with my fellow artist mates in such a great setting.